With Bill View channel 810 you can view your account balance instantly without having to wait for your statement in the mail or calling in! You also have the ability to view the summary of your account entries such as movies purchased, opening balance, ending balance and more. This feature is only accessible if you have a set top box. This feature allows you to obtain your current account balance information over the telephone using a touch tone phone. You will be prompted by the IVR menu for a series of responses using the touch tone pad, and will be provided with the many ways you can pay your bill. 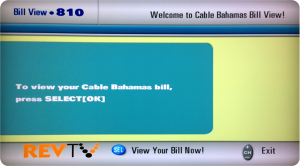 IVR feature can be used with or without a set top box.